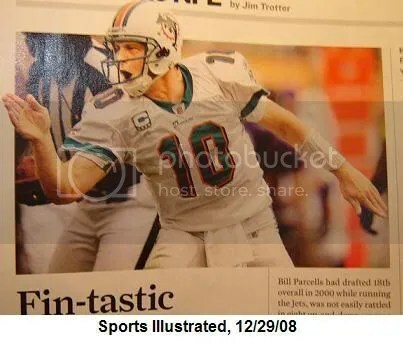 Thanks to Sports Illustrated for obtaining photographic evidence of Pennington’s patented “air stab.”[insert your stupid Ray Lewis “stab” joke here, haters] Sunday, the Ravens will redefine the SI curse, from the “cover jinx” to the “caught looking like a moron” jinx. This entry was posted on December 31, 2008 at 10:01 am and is filed under Hating, Ravens. You can follow any responses to this entry through the RSS 2.0 feed. You can leave a response, or trackback from your own site. Actually, I would make Pennington MVP. Parcells called all the right shots and Pennington did more to this team than ppl will give him credit for. Now, does that mean he’ll single-handedly beat the Ravens this wknd—not really. how many times can you “Comeback” in one NFL career?